This is what happens when you're showing your house and you forgot you put (hid) cornbread in a cabinet where it doesn't belong. Pretty disgusting, huh? 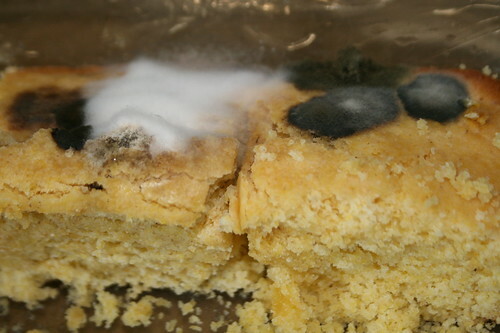 I guess today was a day for moldy food. I also found some cupcakes from Kade's birthday and the shortcake I made last week was moldy too. Maybe my housekeeping skills are going down hill. Maybe I'm a little preoccupied with packing up the house and finding somewhere to live. Probably the second. I don't believe there is such a thing as too humid. Do you remember ALL the water and lotion I went through when I was visiting for just a week? I felt like I couldn't get enough. The west is beautiful in it's own way but I don't think it's for us. Maybe just to visit.